Two powerful drug cartels fight to control the supply of drugs destined for the United States in the murder capital of the world, Juarez. A politically sensitive assignment in Mexico's deadly border region draws former FBI psychologist Roy Neely out of retirement. Neely joins forces with DEA Agent Jamie Gamez on the complicated case, which starts with the kidnapping and killing of several elders from Mormon rancher families that have lived in the area for generations. Things become more dangerous when a whistle blower reveals that a well-connected defense contractor is illegally shipping arms to the warring cartels. 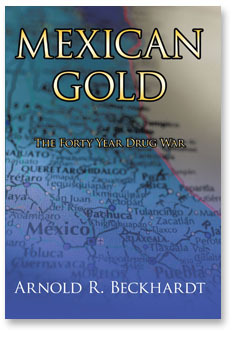 Read an excerpt from Mexican Gold.